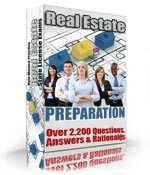 The Michigan Real Estate Salesperson Exam consists of national and state specific questions. The Michigan Real Estate Salesperson exam is comprised of 110 questions. In order to pass the exam an examinee must answer 77 out of the 110 questions correct to pass. The time limit allowed to complete the Real Estate Salesperson exam is 180 minutes. Real Estate Salesperson Exams in Michigan are administered by PSI exams at www.psiexams.com. Before registering with PSI for the Michigan Real Estate Salesperson Exam you must first apply for a real estate license at www.michigan.gov/iCOLA and your exam authorization will be forwarded to PSI. You are responsible however for scheduling your exam date with PSI. If you are considered eligible for a salesperson license by the State of Michigan before taking the exam, you may be able to receive your salesperson license at the examination site. The Michigan Real Estate Salesperson Exams are taken on a computer and you will get your exam results immediately after completing the test. The exam is closed book so leave your study aids at home. Also remember to bring two forms of identification to the examination site with at least one having your photo on it. The fee to take the Michigan Real Estate Salesperson Exam is 48 dollars.